When we first decided to get chickens, my intention came from an omnivore’s point of view….FRESH EGGS! Little did I know that these little darlings would become our lovable pets first and foremost….and fresh eggs as a really cool bonus feature. Sidenote: Wouldn’t it be cool if every pet came with an unrelated bonus feature….like if your cat does your dishes or your dog mows your lawn!??? So back in January, I promised the boys that we’d get another batch of chickens to add to our current flock of 5. The three of us spent hours researching each and every kind of chicken breed and finally decided to surprise ourselves with an assortment of 5 day-old baby chicks from the “rare breed” category from My Pet Chicken. 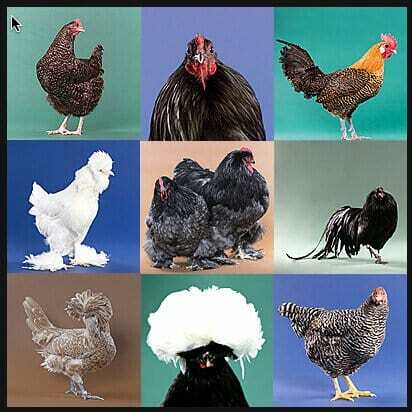 We were guaranteed at least 3 of these breeds (see photo on left from My Pet Chicken). Some of these guys look so funny! With furry feathered feet, a pompadour hat, mohawk or gown of feathers! 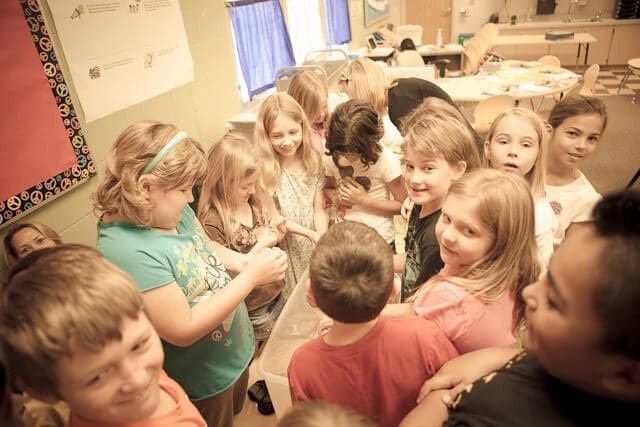 There’s a high demand for day-old chicks (go homesteaders!) and we wouldn’t be able to get our chicks until first week of April. Baby chicks are shipped precisely right when they hatch, there’s actually no need for any food or water for a couple of days, as the yolk they’ve consumed during their incubation sustains them during the transport. The biggest worry is cold, so the chicks are shipped with a heat pouch – you know the type you slap and stick in your pocket when you’re skiing. Sure enough, they arrived safe and sound! 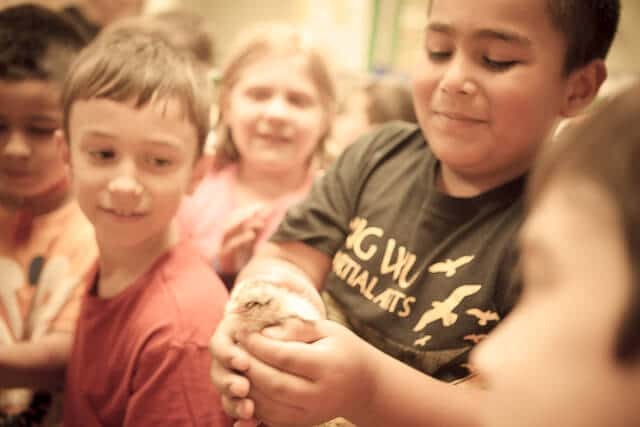 We toured at least 12 different 1st and 3rd grade classes with the baby chicks. 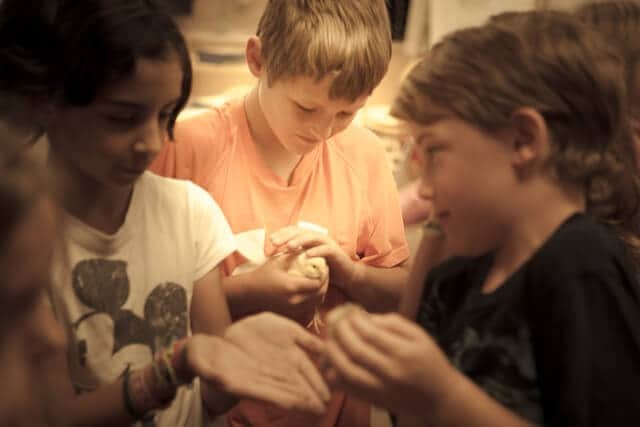 Oh I wish I had videotaped it – for some of the kids, it was the very first time they’ve ever touched a live chicken. The oooohs and aaaaaahhhh and awwwwwws! One of the chicks even fell asleep. My name is Bob and I’m in process of building a chicken coop/run and saw your palace. Was wondering if you could send me your measurements on the nesting boxes, your doors, well actually any of the measurements to give me an idea of how I should do mine. My coop is 4’x8′ with a complete structure of 8’x14′. 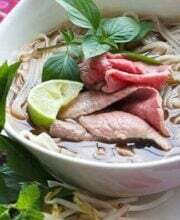 Truly love the look of yours and would like to create one very similar. The nesting boxes are 12″ wide by 12″ deep by 16″ tall that slope down to 14″ tall in the back. odczytu , ponieważ masz smak. The chicks are quite comfortable in their nests with their sibs. They are kept warm and cozy with the heat pack. Live cargo is never subjected to machinary, but is carefully hand processed. It has been done this way for years quite successfully. As was pointed out, they don’t require more food for a few days, so this method is not cruel. It’s true though, they probably didn’t have a nice lullaby soundtrack to enjoy while being transported. It wouldn’t be financially sound for the chicken folks to deliver via a method that resulted in dead chicks. That would put them out of business in replacement costs. Those chicks are absolutely adorable – BUT – I so hope you will think twice before ever again buying day-old baby chicks through the mail. Imagine what they go through: stuffed into boxes, sorted on noisy equipment, jammed into the cargo holds of planes or onto the backs of trucks. These chicks are treated just like any other pieces of mail, and in many cases the little guys are killed in transit through exposure to extreme heat or cold, by being delayed without food or water, or by being crushed. It’s just awful! OMG THEY PUT THOSE CHICKENS IN THE MAIL??!!?? aaaiiiieeeeeeee!!!!!! I’m not an expert but I think the little yellow chick that keeps hiding behind the heating element may need extra attention as it appears to be weaker than the others. If we assume that the population of rooster and hen chicks are born approximately equally what happened to all the cute little roosters? I chose to not have chickens when I realized that they kill most of the rooster chicks because people only want hens. I HAD to link to your post on my blog… we’re (hopefully) exploring the possibility of having urban hens in Edmonton. Bylaw and City Council are looking at it, and in a few weeks, we may be able to have our own little insect controllers patrolling and fertilizing the garden! Oh how cute are these furballs ? I want one now or two or three! They’re so adorable! Thank you for sharing. When I was young we lived in the country and raised baby chicks every year – some for the freezer and some survived for egg production. It left me with a great memories and survival skills as well. The laying hens were my pets and I used to make little scarves and capes for them and carry them around. If I had a rooster now I think I’d name him Harley. Or Little (after Chicken Little) How about Henny Penny? 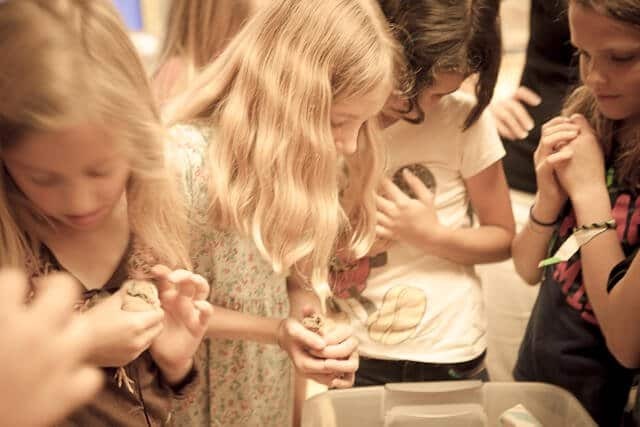 I remember the feel of the soft and fuzzy chicks from my childhood:) I can’t show the video to my girls as they will want me to follow your steps (which I would do in a second if we were not living in an apartment:) As soon as I get my hands on some SoCal dirt, I am getting me some chickens! I’ve always wanted to name something Reebok! So if yo have an especially active chick he might be ‘Reebok’! So cute…I like the name Mr. Peepers. Pets totally come with side benefits! Dogs teach you to live in the moment, and also force you to exercise, and cats are snuggly and they kill mice. Oh my goodness – those chicks are absolutely precious. The looks on those kids’ faces says it all. I think you made their week! Thank you so much for the videos. Your new family members are so cute. Tell me something, i assume that the ones with the mottled coloring will mature with either the same or quite similar color and markings. What about the yellow ones. Do they retain that color also? Finding a name is needs all the input available. Have a wonderful holiday weekend. Adorable! My mother in law has oodles of pet chickens. Several years ago, she decided to let my then 9-year old brother in law name one of the new chicks. This little chick pecked at the ground more than the others, so he was named Pecker. Now that my brother in law is 16, he gets a big kick out of that. Cute cute CUTE! We hope to get our chicks next month. We’re thinking of using a theme to name them, maybe hobbits from Lord of the Rings or something nerdy like that.